Striking pictorial Nepalese handmade rug in truly excellent condition. Wool pile — most likely high elevation yak wool — woven onto cotton warp & structure. The rug is clearly inspired by the work of Japanese artist Katsushika Hokusai (1760-1849) — in particular his most famous woodblock print, The Great Wave Off Kanagawa, created some time in the 1830s. Hokusai was focused on multiple depictions of Mt. 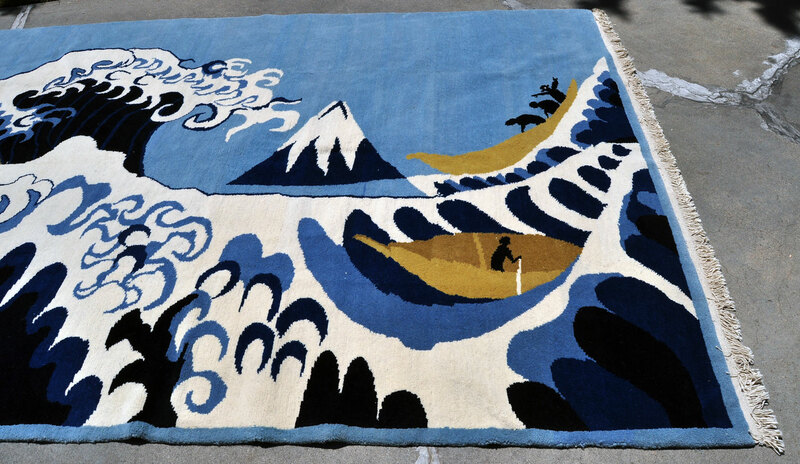 Fuji, which the rug faithfully reproduces in the background, majestically overlooking the wave as it assails the small boats and the desperate fishermen. The rug is thick and heavy, and could be placed in a high foot traffic area. 1970s. The price is $595. Shipping is $57 within mainland U.S. Huge handmade Tibetan rug. Thick wool on cotton. Original retail price tag still attached — $7500. Exact size is 13 ft. 2 in. 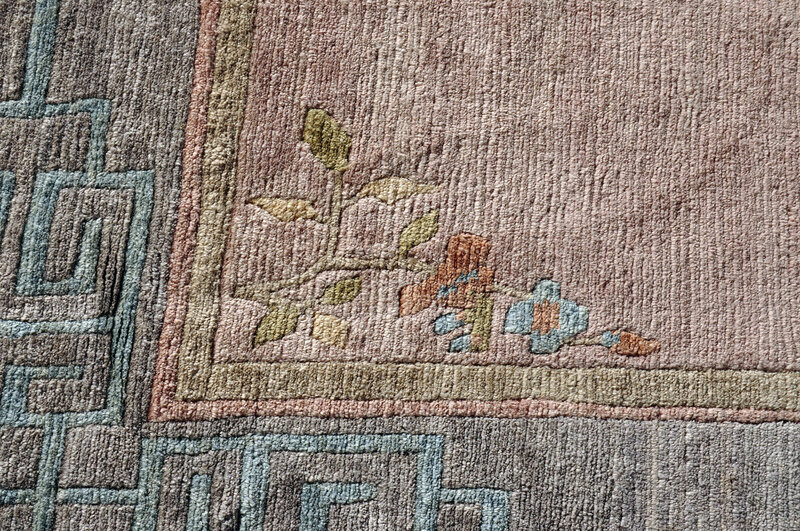 by 10 ft. Photo with coin is the back of the rug. The wrinkles are only from the rug being rolled up after washing and will come out easily once the rug is spread out on a floor and walked on. Very heavy and thick. Rug weighs over a 100 pounds. Neutral colors. 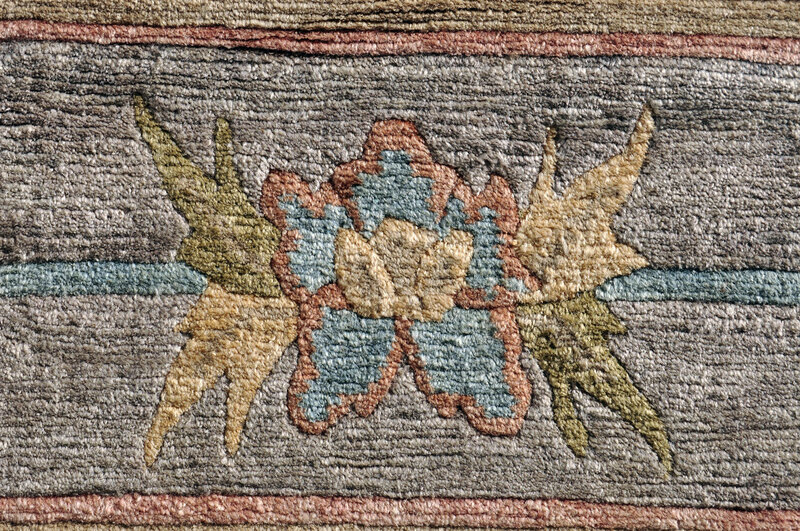 Natural wool (sheep – yak) woven onto natural cotton. No wear. This is a rug that can handle heavy foot traffic and last for many decades. No synthetic materials, no outgassing such as happens with manufactured carpeting. Perfect for children and infants. The rug was in storage for a number of years and needed the dust washed out. It was professionally hand-washed by Artisan Fine Rug Care in Santa Cruz. Free local pickup in the Bay Area or Monterey area. I have a storage unit near the Oakland airport where it would be easy to view and pickup the rug. I can ship it but weighs over a hundred pounds so probably around $125 to ship. I will have to add shipping costs depending on your location if you need it shipped. Please email me with questions or to schedule a viewing. Thank you.